This is a free crochet pattern for a lacy afghan that uses beginner crochet stitches in a unique combination to create a beautiful design. It uses the same crochet stitch pattern used in the smaller free crochet lapghan pattern but the instructions shown here are for larger blanket sizes. Because the stitch pattern is simple and it is an openwork design, the blanket still works up quickly, making it a terrific pattern to use for making handmade gifts and donations to charities. The amount of yarn required varies based on desired blanket size. Use approximately 4.5 oz. worsted weight yarn for every 7 rows for the 364 chains starting chain size. You can use any brand or color worsted weight yarn. Work this crochet pattern with a size H crochet hook. The complete crochet blanket will be approximately 70" wide for the smaller version described below and approximately 92" wide for the larger version. Crochet to the desired finished length. As an alternative, instead of the rows displaying horizontally, you could use the starting chain as the length of the afghan (where the rows would be displayed vertically) and then crochet as many rows as needed to achieve the width that you want. 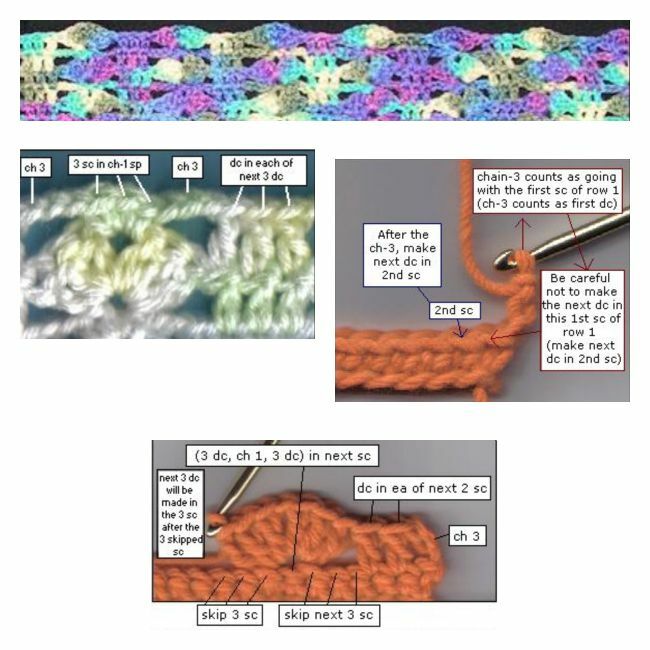 Gauge: a group of 3 dc stitches = 3/4" wide; 2 pattern repeat rows (rows 3 and 4) = 1"
Starting Chain for 70" wide: Chain 264. Starting Chain for 92" Wide: Chain 364. Note: If you want a narrower afghan, subtract from the starting chain in multiples of 10 (the repeat is 10 stitches wide). Row 1: sc in 2nd ch from hook, sc in ea ch across. Row 2: ch 3 (counts as 1st dc), dc in each of next 2 sc, * skip 3 sc of previous row, then (3 dc, ch 1, 3 dc) all in next sc, skip 3 sc of previous row, dc in each of next 3 sc **, repeat the directions between * and ** as many times as needed across the row. Row 3: ch 3 (counts as 1st dc), dc in each of next 2 dc, * ch 3, skip next 3 dc, 3 sc in chain-1 space, ch 3, skip next 3 dc, dc in each of next 3 dc **, repeat the directions between * and ** as many times as needed across the row. Row 4: ch 3 (counts as 1st dc), dc in each of next 2 dc, * skip the ch-3, skip next sc, then (3 dc, ch 1, 3 dc) all in next sc, skip next sc, skip the next ch-3, dc in each of next 3 dc **, repeat the directions between * and ** as many times as needed across the row. Additional Rows: Repeat Rows 3 and 4 for pattern, as many times as needed to reach the length that you want for your afghan. Last Row: ch 1, sc in first dc, sc in each of next 2 dc * 2 sc in ch-3 space, sc in each of next 3 sts ** repeat the directions between * and ** across the row, end the row with 2 sc in last ch-3 space, sc in each of last 3 dc. Finishing: End off. Weave in ends. If desired, add an edging of your choice.